With growing understanding of neutralization and with recent technical advances it is now possible to select or design antibodies (Lerner 1984), including those having physical attributes and binding sites which do not exist in nature. Heavy chain gene switching in hybridomas or recombinant DNA technology allow the variable region to be expressed in conjunction with any or all of the immunoglobulin isotypes, e.g. for the NP hapten (BrüGgemann et al. 1987). These have been used to study their ability to activate complement via the classical or alternate pathways where the only variables were the immunoglobulin heavy chain constant region and the epitope density (Valim and Lachmann 1991). Sets of neutralizing immunoglobulin isotypes with identical paratopes have not yet been made and studies, for example on the efficacy at neutralization in vitro and in vivo, are anticipated with interest; it can be envisaged, for example, that the different flexibility of arms or elbows of antibody (see Burton 1990) may permit bivalent binding in one isotype which is not possible in another. 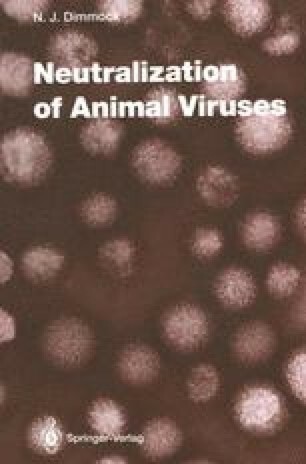 This is of particular relevance to neutralization of poliovirus (Sect. 23.5). In vivo a particular isotype may offer advantages which would favour protection such as tissue distribution, complement fixation or the ability/inability to bind to Fc receptors. More radical is the report that antibodies can be made to enter cells by altering their solubility (Kabanov et al. 1989a,b). If confirmed this opens up the possibility of reaction with new epitopes, on immature virion proteins, on internal virion proteins and on non-virion proteins. A hybrid antibody with two different specificities can be made fusing two hybridomas (Suresh et al. 1986), and this offers the possibility of bivalent binding to heterologous epitopes when the homologous epitopes are an unfavourable distance apart.